The following article appeared in the Fall 1996 issue of Stained Glass (Quarterly of the Stained Glass Assoc. of America). To understand Father Daniel Peter Hillen and his art, one must go back to his hometown. Dan Hillen is a Butte boy. More specifically, he is an Irish-Italian Catholic Butte boy and the son of a miner. In Montana that sentence would say it all; Montana is a state with more than enough room under its wide-open skies for characters and eccentrics. Butte is a company town and a Catholic town, a town physically dominated by the Continental Divide and the huge open-pit copper mine of the old Anaconda company. In a state that worships individuality, Butte is still larger than life. Hillen's father was a miner and later a shift boss, a man who made his living in the dark caverns of the earth. His son's life would become a step more primordial--stained glass, the distillation of light and melted sand. Hillen was ordained to the priesthood of the Roman rite in 1969 and received a Masters in Divinity from St. John's University in Minnesota. Hillen is a man who took the priesthood and his faith and married both to his glass art; along the way he taught college for more than 20 years at his alma mater, where he earned his first of four degrees: a B.A. in Philosophy. Thus far, Hillen's life has still had two specific high points: the year he spent restoring the German glass in his own diocese at the Cathedral of St. Helena and the creation and eventual destruction of his 12 stained glass fictional Life magazine covers. Hillen remembers "always being an artist." As a child he vandalized his prayer missal by filling the blank pages with drawings. Years later he would gain a BA in Fine Arts from the Minneapolis College of Art and Design and an MFA from the University of Montana as well as post-graduate study at Pilchuk in Seattle. His journey into stained glass began when fate combined with a winter storm and an unfinished art project. In 1974, it was snowing when Hillen visited a Minneapolis hardware store. He was trying to wrap up a class project to make the alphabet in 26 different media. The store was already closed; he waited out a storm across the street, at Gaytee Stained Glass Studio. Fascinated by "a back room full of old men soldering and smoking cigarettes," he went back for three straight days "to just stand and watch." The third day he bought enough glass to make the letter 'T' for his upcoming exhibition. Twenty-two years later, Hillen has become the artist that Richard Mesmer of Seattle, a former Financial Secretary of the Stained Glass Association of America, salutes as a "Renaissance man and a national treasure." 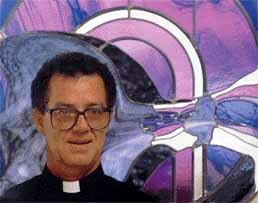 Mesmer met Hillen in 1982, when he heard about "this priest who was attempting to restore the glass in the Helena cathedral." The cathedral, built at the beginning of the century, contains 56 hand-painted windows by the world-renowned F. X. Zettler of Munich. Admittedly opinionated, Mesmer asked himself what in the world could a priest know about stained glass and how big a mess was he making? He traveled to Helena, convinced that Hillen must be discouraged from undertaking the project. Hillen, who studied under Albinus Elskus, set to work with scaffolding and binoculars. This would be the first professional restoration since its installation 55 years earlier on glass valued at close to $16 million and considered to be one of the finest art collections in the state. The full project--surveying, cleaning, repairing--would take a year of Hillen's life, closing the cathedral down for six months in mid-1982. Much of the damage to the glass happened during a major earthquake in 1935. In addition, someone entered the church armed with a gun and shot out several sections. Some of the patch jobs he uncovered are the stuff of legend. Hillen would eventually discover 122 broken pieces that had been patched with regular window glass and touched up with house paint. "This guy can absolutely do it all-and better than most," Mesmer comments. "He is way ahead of his time ... when does this man have time to hear confessions?" Mesmer remembered his original opinion that "I thought this guy couldn't possibly be authentic to the original (glass). I was wrong. He was determined to do it right." "It was an immense honor, because I'm so connected to that building," Hillen added. "I have celebrated the sacraments there, and we use the church for our graduation Mass. St. James in Seattle is the closest cathedral, and it does not compare to the rich beauty of ours. Even the stained glass in Votive Kirche in Vienna, which our cathedral is modeled after, doesn't compare. The glass in the Cathedral of Saint Helena is one of the finest examples of the Romantic painting style coming from Europe." Three years later, Hillen saw a national news story about the Ethiopian famine and that country's current leader's $250 million birthday party, juxtaposed between cat-food and low-fat cereal commercials. "It was too painful to ignore," he remembers. His next defining work, the Life series, was born. Over a period of four years, Hillen produced a dozen giant, fictional Life covers (48"x34"). His painful horror at the newscast "needed to be more permanent. I decided a magazine cover would be the best vehicle." The issues addressed include the environment, German concentration camps, Vietnam, John Lennon and the Cherokee's Trail of Tears, all coming together, illustrating the constant ironies surrounding life. A series born of horror and irony became true to its heritage. Life magazine heard about the series--and threatened legal action for trademark, infringement. Hillen's lawyer argued First Amendment commentary; the magazine threatened more legal action. After showing the series in Helena in 1989, Hillen packed it away in his studio for more than five years. "It was a very painful legal dialogue, and I was more than depressed," he added. The series sat until last year, when galleries in Montana chose to exhibit them despite possible legal repercussions. Recently shown a half-dozen times, the series was destroyed last March in a car wreck. Hillen winced at the still-painful memory. "As someone wrote to me, these are your 'Stations of the Cross,'" he said. "They were my children. I have an excellent video, great slides and wonderful memories." Hillen is someone who fits the stereotypes of neither a priest nor an academic. He came to a recent interview wearing a Picasso T-shirt and a scraped knee covered with a cartoon band-aid. "There are two ways to make art," Hillen said, swinging into a lecture. "You solve someone else's problems or you solve your own." Living in isolated Montana, Hillen is relatively self-taught. Long before the advent of machines which can cut difficult shapes, Hillen taught himself to do it by hand. "I hate unnecessary lead lines. Every line in the panel should be part of the overall design and not call attention to itself. In realistic works, if the lead lines interfere with the design, then I think the designer has failed. I feel my strengths as an artist come from a strong sense of design and color." "I like the palettes of antique mouth-blown glass," Hillen observed. "Johannes Itten once said that 'Every color is a universe unto itself.' There's no such thing as a bad color. Sometimes it's just not the right day for that color. The medium itself is so beautiful that I sometimes feel guilty cutting a sheet of glass. It took other artisans to make the material--it takes great craftsmanship to blow the cylinders and cut it open and give it to us. It's a long process of craft and art." Not just dependent on the craft of a glassblower, Hillen noted, stained glass also depends on sunlight. "It is in fact the only medium totally dependent on light," Hillen continued. "When the light disappears, the art dies. This art is ever changing, like life itself." "My art is more than a single style. I work in realistic as well as abstract and non-objective styles. Glass is a visual language... a dialogue. I believe we as artists have a responsibility to society. We have to never stop telling our collective stories in new ways. We can challenge our viewers by humor, by anger, by fear and by faith. We are the only group given communal approval to do so. Historically, glass was a rather polite medium, designed to delight the eye. I think we are just starting as glass artists to challenge our society. I try to do that. I feel that the visual language of abstraction in glass can lead us to deeper spiritual experiences than perhaps realistic images did in the past. "So is the glass medium or message? Maybe it's both, waiting for the sun to dance with it," Hillen observed. "The medium itself is so technically complex and takes a long time to master. I remember being at a conference once where everyone was talking about 'form and technique,' and I wanted to talk about 'content.' You can talk about how a work was created for only so long, and then you have to ask 'What meaning does it have?'" Mesmer agrees. "Being isolated up there has forced him to be creative. He learns and works until he gets it right. I think his work is far superior to anything Andy Warhol did, and I think he's ahead of his time. He's not afraid to learn and to learn from others. He's totally committed at all levels of his art." Mesmer evokes two names to make a final point--Leonardo da Vinci and Dale Chihuly: "Da Vinci wasn't fully appreciated while he was alive, and I don't think Hillen will be appreciated until people take him in context for what else was going on around him. For what Chihuly is in the hot glass world, I think Hillen is equally as gifted in the art glass world. He is so good, he is his own competition. His light burns strong. He is his own little treasure." A final thought from the good Father: "My spiritual side is very much connected to the aesthetic side. In the absence of serious conflict in my life over those two issues, I have probably the best job on the planet. It is such a joy to create with a design that seems to come out of nowhere but really comes from a deep well within." Dan Hillen finds the rationale behind stained glass apprenticeships simple and practical: America's stained glass is aging. And on the horizon there should be plenty of jobs for artists trained in repair and restoration. As a college professor, Hillen's major focus is the practical working of a craft apprenticeship married to academics. He envisions a two-year associate of arts degree in stained glass--a program of four academic semesters with restoration apprentice work spread out over weekends and two summers. "I want a program that, when you leave, you have enough knowledge to make a living as an artist," he says. For years, Hillen has had numerous student requests for just that program. It's been talked over with fellow artist Barry Hood. Basic craft courses would include cutting glass; constructing lead, copper, zinc and foil; etching; sand blasting; fusing and slumping; traditional and nontraditional lampmaking; beveling; repair and restoration; and painting on glass. For academics, Hillen wants four semesters of art history, Carroll College's core curriculum and at least one business course, "so they don't go broke the first week in the real world." Montana's churches play a part. Homesteaders started coming to Montana in the 1860s, and now this huge state holds much stained glass in need of work. Hillen's apprentices would tour area churches and donate labor. "I want to give something back to the community," he explains. His studio accommodates 32 students (with 16 4'x12' worktables). "But, a maximum of 10 apprentices would let me continue to offer glass to general students." "All I could think to myself was, 'Who in the world schedules a glass show in Montana in January?'" It was January 1996 and 40 degrees below zero as the Rev. Daniel Peter Hillen inched his way through a blizzard over the Continental Divide. Hillen, who lives and teaches in Helena (the state capital, 100 miles to the east), was being showcased--along with Seattle's Dale Chihuly--at a four-gallery glass exhibit sponsored by the University of Montana in Missoula. Two months earlier Hillen was up north in Great Falls, Montana, in the bitter cold and loading up the same show: his famed series of 12 fictional Life covers. Missoula was to be the show's last road trip. "I'm exhausted. It takes a great deal of energy to move these panels and their large display cases. I'm never doing this again," he vowed. That January afternoon a car ahead of him suddenly lost control. Hillen's own defensive reaction set him in a slow-motion spin across a winter road of ice and snow. Unloading later at the gallery, he would find enough broken glass to require 36 hours of emergency repair. Five weeks later, on Sunday, March 3, Hillen packed up the show and headed back over the Divide-again in a bitter, icy snowstorm. The 12-panel Life series and four pieces borrowed from private collections went in the van. Forty miles from home and before the ascent over the mountains, Hillen hit a patch of black ice, and the van started sliding across the freeway. "All I could think of was, 'Please God, don't let me die yet. I haven't cleaned my studio,'" Hillen remembers. The resulting accident would total his van and destroy the signature creation of his career--the entire Life series--and almost cost him his life. That morning, Hillen had hurt his shoulder loading up the exhibit and couldn't wear his seat belt. It was a detail that in a few hours would save his life. As the van began to careen out of control, the glass exhibits in the back of the vehicle shifted weight and the momentum shoved them into the front seat, slightly shifting the angle of the seat. In that instant the air bag deployed, shoving Hillen out the hole where the driver's door had been before being torn off by a guard rail. Hillen tumbled onto his feet just as the van started its somersault off the highway. He watched helplessly on the side of the road as much of his life disappeared in a ballet of breaking glass and leaking gas. "One second I'm in the van; the next I'm standing in the road watching my van roll out of control and crash into a boulder," he added. Father Hillen sustained three cracked and two broken ribs. He lost his glasses that day and came back a month later after a snow melt to find them lying neatly in the ditch, unscratched. In july, the van's crumbled door still lay at the roadside. The only artwork to survive was a small, delicate blown-glass heart. Hillen estimated the crash cost him in excess of $180,000. Salvaged pieces of the van, the license plate and glass fragments may go into a final Life panel which he'll title After Life. "Art is a continual creation," Hillen observes, "but it's hard to do if you're dead. At least I wasn't maimed or killed. One friend reflected that there were 13 'lifes' in the wreck and God must have saved his favorite."